I've lost track of the number of times people have told me about the 'enormous wealth of the Vatican'. Some are confused: they think the Vatican owns all the Church's worldwide real estate, lock, stock and barrel. Others think that all that art could be sold for the poor without adverting to the difficulty of selling Michelangelo's Sistine Chapel ceiling or the rooms containing the Stanze of Raphael. Most just think the Vatican is corrupt and busy laundering vast sums of Mafia money through the 'Vatican Bank'. The papacy hasn't helped itself with its insistence on an absurd level of secrecy and its earlier involvement with criminals like Sindona and Calvi. Well, now for the first time we actually have some hard facts. Benedict XVI has been determined to clean up the Holy See's finances. In February 2011 he called in the Council of Europe's experts on anti-money laundering and financing of terrorism, Moneyval. Moneyval and their 241 page July 2012 report (plus annexes) gives us an enormous trove of factual material about the Vatican. Before dealing with the money, some other interesting facts. As Moneyval says 'although the Holy See (HS) is not a state in itself, it has sovereignty over the Vatican City State (VCS) which is the smallest sovereign state in the world'. It is the HS, not the VCS, which is officially recognised by governments like Australia. VCS is 44 hectares in area with 595 citizens with 348 of these living outside the VCS. You become a citizen not by birth but by office, that is by appointment to a specific job for the HS/VCS. Citizenship is lost upon the termination of that employment. With six million visitors annually the VCS needs its own 137-strong police and security force, or Gendarmeria; most are ex-Italian police. Crime rates are very low and mainly involve petty thieving, almost all occurring among the tourists. Moneyval's main focus was on the HS's two financial institutions: the Institute for Works of Religion (IOR), the 'Vatican Bank', and the Administration of the Patrimony of the Apostolic See (APSA). The IOR (founded in 1942) essentially operates as a commercial bank whose customer-focus is on deposits 'destined for religious works or charity'. It can also take deposits for other purposes, although its customer-base is restricted almost entirely to religious orders, dioceses, parishes, seminaries, bishops, HS departments, employees and retired employees of the VCS. It has 33,404 accounts and 20,772 customers. There are 47 accounts in Oceania, presumably mainly in Australia. Lay people hold 32 per cent of these accounts and clerics and/or religious 68 per cent. The IOR employs 104 people. The IOR has 6.3 billion Euros under management. For comparison the Commonwealth Bank has US$500 billion in assets. IOR carries out most bank functions except it doesn't lend money including consumer and mortgage credit, although it issues credit cards; it doesn't provide financial guarantees and doesn't underwrite insurance. It only has one branch and 13 ATMs, all within the VCS accessible only to clients of IOR. One of its most important services is customer payments via wire services. This is where most of the money-laundering accusations are focused. IOR investments are mainly in low-risk, short-term, fixed interest securities; it avoids the equity, precious metals and foreign currency markets. Most of its revenues are derived from commissions and service fees. The IOR uses the services of more than 40 banks in Europe, the US, Australia and Japan to facilitate its investments and transfers. The other financial institution is APSA, the Administration of the Patrimony of the Apostolic See. APSA is an office within the Roman Curia. It administers the property of the HS and manages funds given to the HS by Italy in accordance with the 1929 Lateran Treaty, that is the money (1.75 billion lire) paid to the HS for the Italian seizure of the Papal States. This money has been invested and APSA relies on clerical and lay advisors for expert guidance, most of whom work for free. APSA has 680.7 million Euros under management, accounts and deposits with many central banks (e.g. Bank of England, the Federal Reserve) and invests in financial markets and real estate in France, UK and Switzerland. Besides managing HS real estate, it funds the papacy and curia's annual budget, subsidised by Peter's Pence and other income. APSA also pays the 2400 HS/VCS employees and the pensions of 1600 retired employees. Moneyval gave the HS/VCS a reasonable pass mark but added that 'further important issues need addressing' for the HS/VCS to be added to the 'white list' of banking systems considered safe from money laundering and financing of terrorism. But it is a first step in the direction of accountability. All this money talk is a far cry from St Francis of Assisi's "a man who lives on the streets and walks around in rags". The Roman Catholic church is no different from any other church in this day and age in having to manage large amounts of money. And the Church in Rome would contribute vast sums to the coffers of the Italian government by way of the tourism lire. Accountability by the Church is important, not least because of the perception by most of the world's population that the Vatican is secretive and corruptingly wealthy. Isn't the real wealth of the Church not simply in its fiscal assets but more in its physical assets which include immense wealth in Art and religious artifacts. Pam I agree with your comments around accountability. However I disagree with you about it necessarily being a far cry from St Francis. We live in a different world with money at the centre of it. For the Church to complete its mission it must be involved in the financial world. I commend the Pope for his actions thus far. Sadly the secular world focuses on the negatives of the Church. I like to rejoice in the positives. Plot line: A butler who says he is only an agent of the holy spirit and a pope who plans to forgive the butler after he is found guilty. Thanks for the article, Mr Collins. For those who choose to state or imply that the the Catholic Church is corrupt, please read on. The Roman Catholic Church is the spotless bride of Jesus Christ. Not so are those religous and laity who seek to destroy the Church from within for their power, material greed and self-glory. The Catholic Religion was founded by Jesus Christ to reveal God's Will to man. He who hears the Catholic Church, hears God. As God is perfect, so is His Church. It has never contained error. It has never committed error. It has never promoted error. It is free from any defect. Free from any innovation. It is infallible in all of its ordinary and extraordinary teachings. It can never deceive nor lead astray. As it was in its beginning, it is now, and it ever shall be protected by the Holy Ghost. The Catholic Religion is the only Institution on earth that is ordained by God for the salvation of souls. Many centuries of Catholic authors have described the Catholic Church as the spotless bride of Christ. All pure and white, holy and beautiful. I can only agree with John's comment.But even if all sold and distributed it would not solve the problemsof poverty, famine endemic in much of the world. But while emotionally I enjoy dressed- up liturgies when I see some photographs of Benedict and his cardinals etc. in full flight I wonder what Jesus would have thought. There is also the Extraordinary Administration of the Patrimony of the Holy See - the Vatican's Central Bank. It relates to other central banks and especially the Bank of International Settlements, the central bankers' central bank. It seems to have a clean bill of health. There has been a lot of unseemly business in the Vatican finances until relatively recently, but the data here show that the vatican is actually pretty small time in the financial asset stakes. The IOR is no more than a small scale credit union in Australian terms. And of curse art and heritage are a cost not a usable asset. Thanks for this informative piece Paul. It's refreshing to read something that makes Rome appear in a better light - even if there is some caution on the part of Moneyval about adding HS/VCS to the 'white list'. Surely, in real terms, the "great wealth of the Church and the Vatican" is non-existent until that highly unlikely time when the enormous store of great works of art and other potentially priceless historical artefacts and real estate are put up for sale. Until that time these are worth nothing. They do not even represent security against financial borrowings because they are not available for recovery of debt in the event of borrowed default. This article states quite clearly that the Vatican's real wealth is 6.3 billion Euros. Envy is very poisonous!! I would love to be able to buy a slab of the Cistine Chapel to hang on the living room wall. An interesting and timely article, Mr Collins, thank you. Given that the current business model appears to support the Vatican extremely well, perhaps all of the (ironically-named) Peter's Pence should go only to domestic parishes to support the work they do. Rome does not need it. I was at the Vatican last year. Can someone tell me then, who owns the art works, and why some can't be sold? I know there are probably legal hoops, but I can't for the life of me think that these can't be overcome. It also seems to me that it must be possible to create a body of some sort to administer- and own- the treasures so that the Church is in no way whatsoever connected to them... not even at arm's length. No ownership or possession at all. I know this sounds naive, but it is deliberately so. the simplest, most essential thoughts can be the way to see the truth. I am pleased to see this sort of reporting on Vatican finances. But much more is at stake. I have a report by Richard Leonard SJ who brags about the Catholic Sector's 1,1710 schools the growth of Catholic Universities, the 66 Catholic Hospitals, the welfare organisations which employ 6,600 people, the $43 million raised by Caritas -- and so on. As an Anglican, I am pleased that each of our welfare organisation or schools has to lodge its audited accounts with our diocesan synods. Do the Catholic organisations about which Richard boasts have to subject their end of the year audited accounts to such public scrutiny? But I am afraid that Parish statistics simply report cash in and cash out. I have heard that Diocesan statistics show that if every parish closed down the funds for bishops would ensure that bishops and their staffs would be well funded to continue their operations. "Not so are those religous and laity..." I have no problem with some of the logic of this defence, but it certainly needs to be expanded to Priests, Bishops and Popes. In terms of the Church's perfection I disagree. The Church is in all truth I believe the Church is as prone to wrong doing as any body of humans, but She remains spotless by the blessed Grace and Flowing Blood of Christ, which wash her clean of all sin. I believe it is undeniable that the Church has very much so erred, and that it's teachings at times have been contrary to those of Christ. The popes in calling the immensely sinful crusades were not acting as individuals but in their office. Certainly the Church erred when her Pope commanded or approved (depending on the crusade, there were more than 20) the killing of our Muslim, protestant, orthodox and heretical brothers and sisters using the famous cry "Deus vult". I do not mean to 'bash' the Church, but in order to be the true body of Christs we must look at our past and present and always strive to serve him and his people. We must ask nothing less of His Church (both the visible or institutional Church/hierarchy, and the True or congregational Church). Some of your comments are lamentable. For example, "As God is perfect, so is His Church". Does this not equate the Church with God such that the Church is God? How do you explain the atrocities that the hierarchy, over the centuries, committed in the name of Christ? You state that the Roman Catholic Church is the spotless bride of Christ. What about the Eastern Rite Churches (they are not RC)? What about the Churches of Eastern Orthodoxy? Are you saying that non-RCs cannot be saved? I think your being a little conservative Paul, and I'll stick to my opinion on that. Trent, I hope the Good Lord blesses you abundantly for you stoic support for at the moment, a house of cards. Come on people, leave Trent alone. It's irony. Have you forgotten your English classes? Some correspondents, like many in the past, seem to imply that perhaps the art works etc of the Church might be sold to provide funds for the poor and suffering etc, and thus achieve the greatest of Christian traditions. A position reminiscent of Cardinal Silva's effort in Chili 30 years ago when caught in the hysterical grip of "the preferential option for the poor" and militant liberation theology, he sold all of the Chilean church's treasures and distributed the proceeds to the poor in equal shares. The tequila driven celebrations of the recipients lasted not much more than a week. There was nothing but bad hangovers to show for it!! (told to me by the Cardinal's nephew - but cannot verify it) Good story though!!! Comments here about priceless art works miss the point. Anyone who visits the Vatican figures out quite quickly that the Vatican makes more money out of having them where they are than it will ever make once they are sold. Which they won't be. The Vatican museums are the most expensive in Rome but everyone keeps filing through because you have to see the Sistine Chapel before you die. Also, it is situated in the middle of Italy somewhere, which means that different cultural attitudes apply. Much of the artwork in Roman churches would go to the back of the storeroom if it was ever sold. Besides, the Vatican is in this sense already an art gallery. More time should be spent talking about the money it moves around between current accounts than the overwrought heritage that the Vatican keeps in its hallways. I'm surprised no-one's mentioned the ABC's Foreign Correspondent report "The Almighty's Dollar" by Aussie journo Eric Campbell who raises some of the issues about how church institutions in Rome and the Vatican evade tax due to their classification as religious houses/charities, even though many run at a great profit and outwardly appear to be run more as hotels rather than accomodation for house religious communities and travelling pilgrims. It just struck me that both sides of the argument could be valid (exempt or not), expect for the fact that so much money is involved at a time when most Italians are scraping to get by. But it was pointed out the services provided by church charities, meals for homeless etc. I'd be interested to hear comments about whether there's a fair balance. Wow, just imagine the benefits to society if the Catholic Church actually paid its taxes like other multi-national corporations! Thanks for your comments Trent - as ever, most entertaining. Ron Cini, your comments always seem to follow the two-party opinion polls - it's either yes or no, right or wrong, Holy Catholic or ant-Catholic. I believe we should count our blessings that people have the opportunity to maturely discuss important and controversial religious and ethical issues. You are fortunate that you have a mindset that idealises the church, but for most thinking and honest Christians and Catholics, I don't believe their faith can fully grow and mature until they question it at greater depth. You talk a lot about defending the church, but it's the people you criticise for asking questions who are the real defenders. It's very easy to stand on the sidelines and barrack for a team when you don't even know what's going on in the game and what the players are up to. Michelle Goldsmith you understand of course the vatican is not beholden to Italy etc re taxation; The Vatican is an independent SOVEREIGN ENTITY cf Lateran treaty . 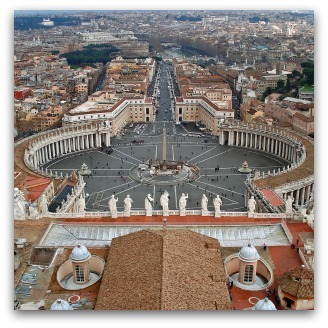 It is SIMPLISTIC TO REFER TO THE HOLY SEE AS MERELY A MULTI NATIONAL CORPORATION. The Holy See, is the central governing body of the Catholic Church and sovereign entity recognized by international law, consisting of the Pope and the Roman Curia. There have been calls from cash strapped Italy,this year, for Vatican to pay taxes. Another day, another opportunity to 'bash' the Vatican on Eureka Street. ho hum. I commend this public accountability of the Catholic Church. Perhaps we can now expect accountability and support for equal rights for women, artificial contraception, abortion, euthenasia and criminal justice for pedaphiles. This article is interesting. I have had the honor of traveling to 77 countries outside the US. I know how sins were forgiven in the majority of the central and south American countries for hundreds of years. I personally witnessed the outragous opulence of cathedrals, bisilicas and chuches in every one of these countries and it is disgraceful to the poor of this world. Now we hear that the Catholic Church in Los Angeles has purchased the Crystal Cathedral for $97 million. Jesus didn't have any building, He had a field and his words were just as memorable. Yet the hierarchy of the Catholic Church keeps saying, give, but do we actually know where what we give goes. Paul a very interseting aticle but it doesn't factor in the "priceless treasures" which the Vatican possesses? What eludes my appreciation is the reasonableness for the continued existence of the Vatican as a sovereign state (we all know it's in Roma, Italia). The recent handling of 'the butler did it..' case highlighted the anachronistic temporal apparatus of the VCS; Vatican magistrates and judges, Vatican police, Vatican cells,Vatican law. The financial apparatus and its workings are but another example. Is it just me? Such vivid expressions of the un-Christlike temporal powers and apparatus of the Roman Catholic Church as it continues to operate out of its own city-state, leave me, at the very least, bemused. Makes me think our church would be much the better for divesting itself of this, the Vatican, the last remnant of its Papal States- if not a Kingdom on earth, a principality. What would be the impediment for our HQ to operate within the laws of Italy just as our Australian Church operates within the laws of our country? We don't have diocesan police, diocesan cells etc handling such criminal matters.... do we? [Why do posts not mention the enormous monetary output from Vatican resources to calamities[earthquakes,famines,disasters] NB medical infrastructure and care for poor. Mmm, 595 citizens, of which 348 live 'over the border' in Italy. Call me crazy, but I bet that the 248 with the really nice digs are male. With an army of nuns and other women coming in to do the menial tasks. Probably the highest proportion of male citizens of any country? i thought money laundering was concealing large amounts of money made through illegitimate means. is not the whole catholic faith "ilegitimate" mr. collins? an occult that tricks people into idol worship and false doctrine instead of biblical truth? anybody with the facts and genuine knowledge please tell me how much money does the Australian Government give to the Vatican. All major political parties now hope they can confine people in Nauru for years on end without any prospect of court supervision and without any need for Parliament to revisit the matter. We have reached a fork in the road between decency and deterrence. As a nation we have taken the low road, inviting the newest signatory to the Refugees Convention to emulate our indecent behaviour.